Where to even begin with this one? We have received some feedback from our users regarding the fact that this Bitcoin “investment” operation is essentially a scam, so we decided to do a little bit of digging, and here’s what we came up with. 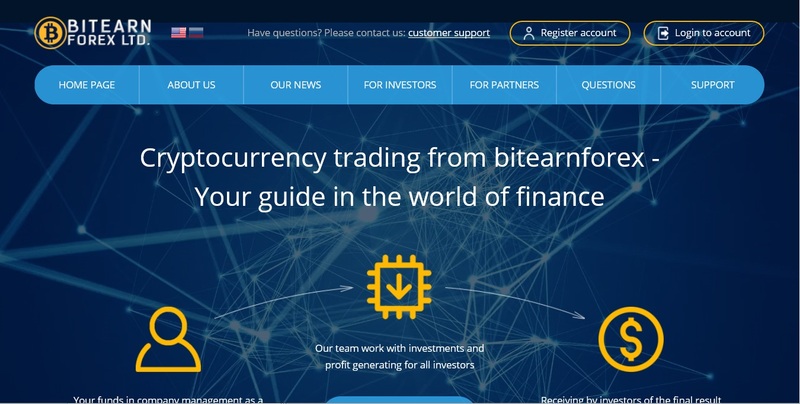 Not only is BitEarnForex.com (a very original URL by the way, which does not look scammy at all – please note the irony here) a scam, it is of the more rudimentary variety, created by a “team” who apparently couldn’t even afford to produce proper English copy for their homepage, thus scaring away those more versed in this industry from the get-go. This state of affairs is actually quite fortunate, but apparently there are still people who fall for the pitch and donate invest their bitcoins into the pockets of these shameless, sophomoric scammers. To answer that question quickly and to the point: it is a lousy, dime-a-dozen scam. If you want to know what it is masquerading as: it is supposedly a Bitcoin investment operation, which promises its investors fabulous (let’s not forget too-good-to-be-true) returns, as their team of professional traders is capable of moving bitcoins back and forth in a manner that will not only allow them to pay out their clients, but will leave something on the side for them too. If you believe that, you should really look into purchasing the Brooklyn Bridge too. Only that would beat this “opportunity” value-wise. Absolutely and positively NOT. These guys are absolutely abysmal at this! Just think of what it will say about you if you fall for their less than amateurish pitches and efforts. These guys are incapable of even making a proper scam pitch. They currently have two investment plans on offer: “First Plan” and “Plan Second”. No, I’m not making it up. Back to “Plan Second” though. This one dangles a return of 400% per week, also for 91 days. The minimum deposit on this one is $1,000 and the total return amounts to 160%. In addition to featuring a list of alleged (and most likely fictitious) withdrawals, the bitearnforex homepage also features a rather hair-raising news section, according to which, there’s a raffle going on right now (wrapping up in a couple of months’ time), involving a Lamborghini Huracan. One has got to give it to these guys: when they scam, they do indeed scam. At this rate, when the Lambo deal wraps up, they might indeed raffle off the Brooklyn Bridge. It has to be noted that in order to take part in the said raffle, one has to make a deposit of at least $1,000, so it’s obvious what they’re looking to accomplish with all this. If you are looking for specifics in regards to how the above described fabulous returns are attained, do not bother: there’s just mindlessly convoluted blurb available about innovative approaches, high-quality services and accuracy solutions – whatever those may be in this context. As you’ve probably already realized, the whole website, from beginning to end, is a giant red flag. The About Us section stands out in this regard. This is how it starts out “The bitearnforex company it is the collective of a new formation and professional orientation of its investment actions“, and it gets better from there. It is a true exercise in copy-generating hilarity, and it would indeed hit home in this regard, if it weren’t the front of a despicable swindle. BitEarnForex.com is just not a well-known scam yet. Few people fall for it apparently, which is quite understandable, considering the shoddy nature of the whole construct. Those who have fallen for it, have the usual tales to tell. Their withdrawal attempts are usually not just met with square refusal. The scammers add more lavish promises to the tally, to actually get them to deposit more instead of withdrawing. Milking their victims to the fullest possible extent is something that one would indeed expect from scammers of bitearnforex.com’s ilk. Prestigious forums such as bitcointalk.org have not even acknowledged the existence of this lowest of possible Bitcoin scam life forms. There is a single post on reddit about it, unceremoniously proclaiming it a scam and warning people away. Based on actual user feedback: do not commit the mistake of striking up a conversation with their support staff. You will only be squeezed for more bitcoins/fiat currency. If you made the mistake of depositing money with these guys, just grass them up wherever you can, and do your best to further ruin their reputation. You will probably have to accept that you will never see your bitcoins again. BitEarnForex.com is such a ramshackle attempt, calling it simply a lousy Bitcoin scam would probably be a praise. Their website is nothing more than an insult to intelligence and so are their “investment plans.” This operation is indeed about as low as one can get in this regard. The bottom of the proverbial barrel is truly being scraped by “efforts” such as this.